Each print is issued with an ORIGINAL PENCIL work specially created by Robert Taylor. 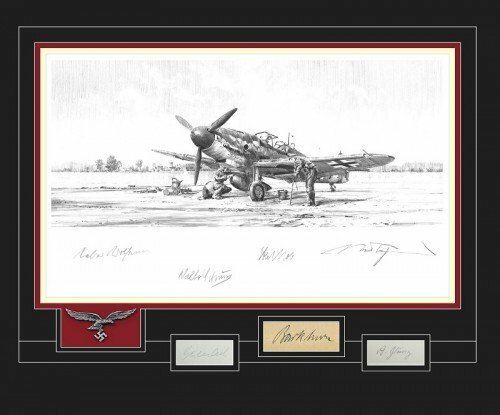 The drawing is signed by three Luftwaffe fighter Aces and conservation matted to include the original signatures of three more - including Gerhard Barkhorn. The Aces included in this historic edition amassed a staggering total of 1012 victories between them! the history of air combat – the Three Hundred Club! Those Aces with over 100 victories were exceptional; to reach 200 victories was a spectacular achievement. Yet two men went even further shooting down more than 300 enemy aircraft which placed them in a league of their own. They were the elite of the elite, and their names are legendary – Erich Hartmann and Gerhard Barkhorn. It is no surprise that these iconic Aces scored their victories whilst ﬂying with the legendary ﬁghter wing JG52 and the Geschwader boasted some of greatest Luftwaffe pilots of WWII among its ranks – including the top three Aces of all time. Such renowned pilots as Gunther Rall (275 victories), Wilhelm Batz (237 victories), Hermann Graf (212 victories) and Helmut Lipfert (203 victories) helped this formidable unit notch up more than 10,000 victories making it the most successful ﬁghter wing in history. Robert Taylor, the world’s premier aviation artist, has created a stunning portfolio dedicated to the two highest scoring ﬁghter pilots of all time. Hunters at Dawn is the ﬁrst release in this pair and features Hptm. Gerhard Barkhorn, Gruppenkommandeur of II./JG52. 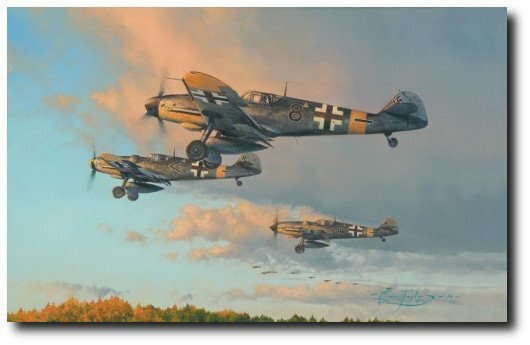 The great Ace, ﬂying his Bf109 G- 6, leads the Stab as they climb out from their base near the Black Sea, early November 1943. The crisp air of day break is temporarily punctuated by the roar of Daimler-Benz engines as the deadly Messerschmitt ﬁghters set off on their daily hunt for Soviet aircraft over the front line.